Forging(Hada): Forging is Itame-hada mixing with streaming indication. The entire forging appears conspicuously visible and it's surface is deeply covered in speckled Utsuri reflection. The entire steel is a bit on darkish side and forging scene is full of classical grace. Temper(Hamon): Hamon is a bit on stronger side Ko-Nie based, Notare undulating mixing with small or irregular Gunome. Some Hotsure fray indication appears along quench area. The interior of temper is filled with foggy crystallize area deeply and shows abundant activity of thick Nie-Ashi or floating dots of YOU. The entire quench scene is a bit on dimmer side in the soft and soaked hard metal granules of Nie with deep foggy Nioi. Temper of tip(Boshi): Quench of Boshi is irregular Midarekomi with Yakizume end of no return. Tang(Nakago): Nakago is a slight Sugiage shortened on about 3-sun (9cm). Two Mekugiana holes. Upper the Nakago indicates horizontal Kiri file marks and lower original area shows Ō-sujikai (greatly slanting left). Tachi-style inscription signature NAGAMITSU 長光 which is full of the elegance of antiquity clearly appears on Shinogi-ji above original mekugi-ana. Ancient times, culture of steel was introduced into Tōhoku region, possibly earlier than other routes, from the Eurasian Continent through Mamiya (Tatar) Straights, leading to Hokkaido and Tohoku region.There is also a theory that the etymology " Tatara 踏鞴 " of the iron melting blower originates in " Tatar " exactly . According to Nihonto　Meikan, NAGAMITSU 長光 who belonged to Mokusa 舞草 group in Ōshu Tohoku region (among Mokusa, Tamatsukuri and Gassani) was active end Kamakura. After the Northern Fujiwara (奥州藤原氏 Ōshu Fujiwara-shi) was overwhelmed by Minamoto no Yoritomo 源頼朝 in 1189, most artisans of Mokusa 舞草 school were scattered in all directions and some accepted and agreed with an invitation by the Yamato first Imperial government to come to metropolis Kyoto to take the lead of Hasebe 長谷部 or Heianjo 平安城 group. The subject NAGAMITSU 長光 Tachi that preserves clearly legible of inscription over the ages of almost 700 years, shows a typical workmanship of Northern region that holds major features "Origin of Japanese sword Tachi" - extraordinary deep waist point curve and less volume of Hiraniku for Nakago that both have close resemblance to one of Kenuki-style Tachi in early stage. Although it is a bit Sugiage shortened by 3-sun (9cm), it still holds the original figure from Kamakura period with wide Funbari standing firmly on base. Steel gives off reflections of mottled sparkling effect Whitish-Utsuri that comes from ancient Middle Ages 14th C.
Recent very good polish/Condition scale: excellent-very good (using a scale of mint-excellent-very good-good-fair-poor). (PS)There is a description of "Country of Hinomoto (northern Kingdom of Emishi) 日本国" and also " Country of Wa (western court of Yamato) 倭国 " in the ancient book of China "Kutouho 旧唐書". In the process of the powerful Yamato Court government ruined kingdom of Emishi 蝦夷 and formed the central unity of Japan, name of "Hinomoto = Japan" was inherited as the official country name. In the background the ancient Yamato Court attacked vehemently "northern kingdom of Emishi", at the time it was a only production center of gold and also it was famous center of iron sand or " iron rice cake 餅鉄" and the other important resources such as lacquer and traditional paper that were essential to the culture of dynasty and nobility. 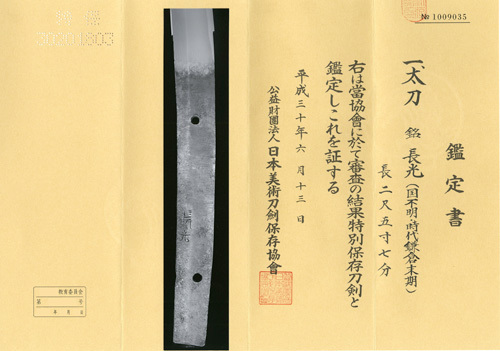 Also to acquire the advanced iron culture symbolized by the Bracken Chop Sword "Warabite-to 蕨手刀", Yamato Imperial Court seized blacksmith technology and iron resources of Emishi as this is considered the designation " Fushu 俘囚" and the blacksmith of Emishi were prisoners of war to have engaged in sword production being moved to the other central areas of Japan. After the most of swordsmiths in Northen Japan had suffered a crushing blow by the fall of Oushu Fujiwara clan 奧州藤原氏 in Bunji 5 (1189), quite a few lineages such as Houju 寶壽 or Gassan 月山 had been active in generations in the Middle Ages (kamakura-Muromachi) and some of them had moved to Kyushu island to hand down their traditional techniques of AYASUGI cross grain forging.